I am really excited to welcome Mimi Sebastian to Illustrious Illusions!! Everyone take a moment and say Hi. . . 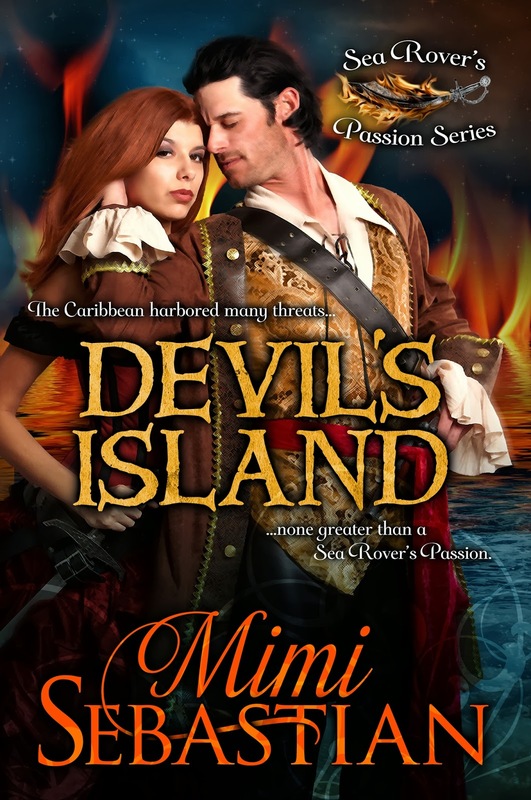 The heroine of Devil’s Island, Sabine Tanner, seeks a way to live independently after her pirate father is hung at the gallows in London. The hanging opens the book and sets the stage for Sabine’s actions moving forward. She sails to find his ship and hopefully a treasure that will provide a means for her to live. It’s hard to make historical romance heroines more independent without being totally unrealistic. I’ve read a couple of authors who have done a pretty good job of creating independent, realistic heroines, and much of it depends on creating circumstances in their lives which force them to become more self-reliant. And in Sabine’s case, after her father was hanged, she was left to her own devices…until she met Boone, of course J. She was also exposed to many things while her father was alive, making her seem less innocent, more worldly than most women during the 1700s. In fact, her father often took her along when he visited his lover, a madam, at her French brothel. Sabine sailed quite a bit with her father and knew her way around deck. What’s fascinating is that women participated in the seafaring life much more than movies and literature led us to believe. The long held myth that women were bad luck on a ship is really not true. While some pirate crews didn’t want women around, it was more for practical reasons, to keep the men from getting too distracted. Some merchant and British navy captains perpetuated the myth to convince their wives not to sail with them so they could visit a mistress tucked away on a foreign island. Yet, many officers did take their wives on voyages, and while on board, the wives helped out quite a bit. I read a great book, Seafaring Women, by Linda Grant De Pauw. She covers some famous female pirates including Anne Bonny and the amazing His Kai Ching Yih. Ching Yih is often considered not only the most successful female pirate, but possibly the most successful pirate, male or female, in history. De Pauw notes that she commanded close to two thousand ships and more than fifty thousand pirates in the early nineteenth century. It was lots of fun writing about Sabine’s life and journey, and with increased knowledge about women’s roles in seafaring, it was easy to imagine her on the deck and sailing around the world, seeking freedom from the normal lot of women at that time. It was great being here today! Thanks for the guest post.